Age Group: 6 Years and up. 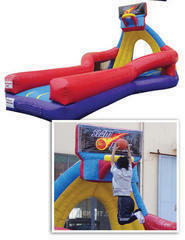 The Slam Dunk Basketball Game is an excellent interactive inflatable game . Participants run down the runway and jump on the inflatable launch pad and try and Slam Dunk a Basketball. It requires agility and timing to score a Slam Dunk. Requires 1 110volt 20 amp circuit.